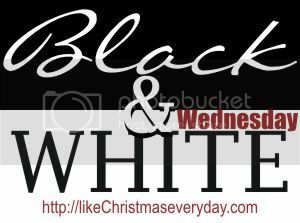 like Christmas every day: black and white Wednesdays - what day is it? Oh no! black and white Wednesdays - what day is it? Oh no! It has been a strange week at work for me with an unexpected day off on Monday and payroll moved to Tuesday. Today is Wednesday and I didn’t forget all you wonderful readers out there. . . but I admit I am late. I normally write all my posts Monday after payroll is finished, but not this week, and for that I apologize. Please don’t give up on my little blog hop. I am working on a cool new “B&W” button for the new year and I think we are going to see even more awesome black and white shots . . . especially with winter and snow approaching. So here we go. . . I may have posted this shot before, but I keep coming back to it. It’s just a deserted street in Alabama on our way home from Aunt Y.’s funeral. Kind of the way it feels after all the excitement of Christmas is over. Be sure to link up your favorite black and white shots this week. For more information about the “rules” of Black and White Wednesdays, click the menu option or click HERE. Still a great shot - can't wait to see what's in store for 2012. Delightful B & W, great photo with excellent lighting at night. I wish you a happy new year. Okay wait a minute I signed in, but I don't see me. Ooops, it's the wrong day too. I'll check back in the morn! Happy New Year my friend.